The following will provide some information as to the reasons damp ingress may occur in buildings, although the reasons noted are not exhaustive. Some will say that Rising Damp is not a true cause of damp but the fact is that Rising damp does certainly exist in buildings. Essentially, it is caused by water from the ground rising naturally through the Capillaries and Pores of the structure on both the internal and external walls. It is for this reason that the installation of physical damp proof courses, such as slate or bitumen coated materials were introduced into buildings during the Victorian era of building. The level of Rising Damp is determined by the following three elements, and is known to rise to a level of approximately 1m, although all situations vary. The elements are the material of the wall through which the water is to travel, the level of wetness within the ground below or adjacent to the wall, and the evaporation level within the wall. When moisture rises through the wall, it gets to a level where evaporation will occur. Over a period of time salts may be deposited at the highest point of evaporation. These are sulphates, which are often seen as white, fluffy deposits on the surface and which is commonly known as efflorescence. This is very different from chlorides and nitrates which are hygroscopic, moisture absorbing salts. Hygroscopic salts in walls / plaster will absorb atmospheric moisture, which can result in the appearance of random damp patches which come and go. Penetrating Damp is caused by water penetration into the fabric of the building either horizontally, or descending. 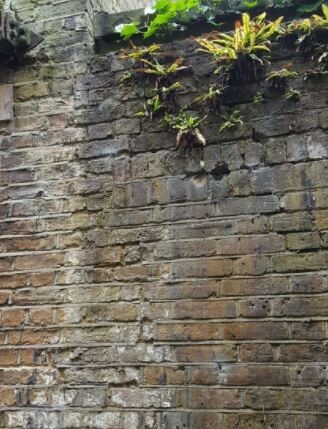 A common cause of Penetrating Damp is where falling rain and / or wind drive rain results in water entering the building structure directly through porous brick work, or, through the external covering such as render where defects or deterioration exist. Another common issue is where the water becomes trapped behind the rendered wall, and it has no escape, therefore leaving only one possibility for evaporation and drying, and that is to pass internally. One of the reasons this can occur is where render coatings have suffered cracking, or where the render has blown from the substrate. 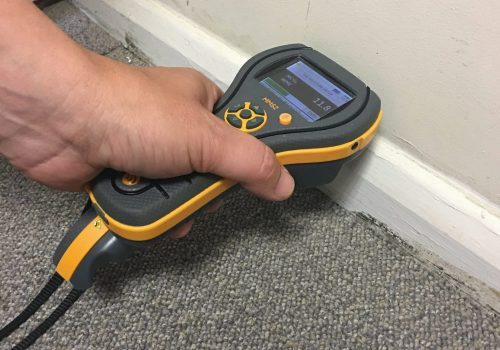 There are many other reasons penetrating damp can enter a property which are generally a direct result of poor maintenance. This can include; chimney stacks that have absorbed water, loose Parapet flashings, broken or missing roof tiles, defects in gutters and down-pipes such as poorly fitting joints, sagging gutters etc., defective seals around door and window frames, defective pointing between bricks and cracked or blown rendered plinths at the base of walls. 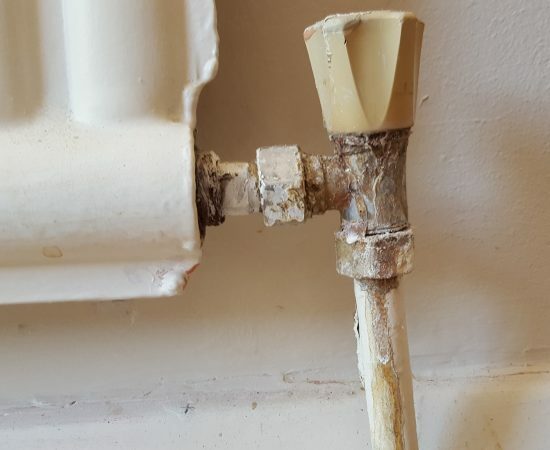 Even the slightest water leak from an internal or external supply pipe or heating pipe can cause saturation, and in turn internal damp. 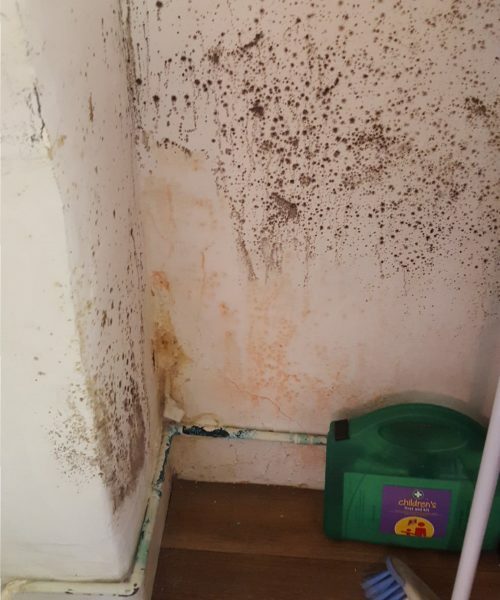 Depending on the location of the leak, the visible evidence of damp may resemble either Rising Damp or Penetrating Damp. Careful investigation is needed to find the point of the leak before considering any remedial work. This may be carried out using thermal imaging devices.